In October 2011 the Home Office amended the Immigration Rules to allow immigration applications to be refused where the NHS had notified the Secretary of State of an outstanding debt of £1,000 or more. In early 2017, this figure was reduced to £500, hot on the heels of the Immigration Health Surcharge and a drive for greater financial recovery from overseas visitors using the NHS. These amendments had no impact on my day-to-day work, and no impact on my clients. That is until recently, when I received my first refusal letter citing NHS debt. The refusal actually very closely mirrors the facts given in an example by Nath on Free Movement back in February 2017. The Home Office, spotting an excuse to refuse my client, went to the NHS authorities to have a bill drawn up, then branded this newly created invoice (never sent to the client) an NHS debt. Unlike in Nath’s example, though, my client was never even liable to pay in the first place. 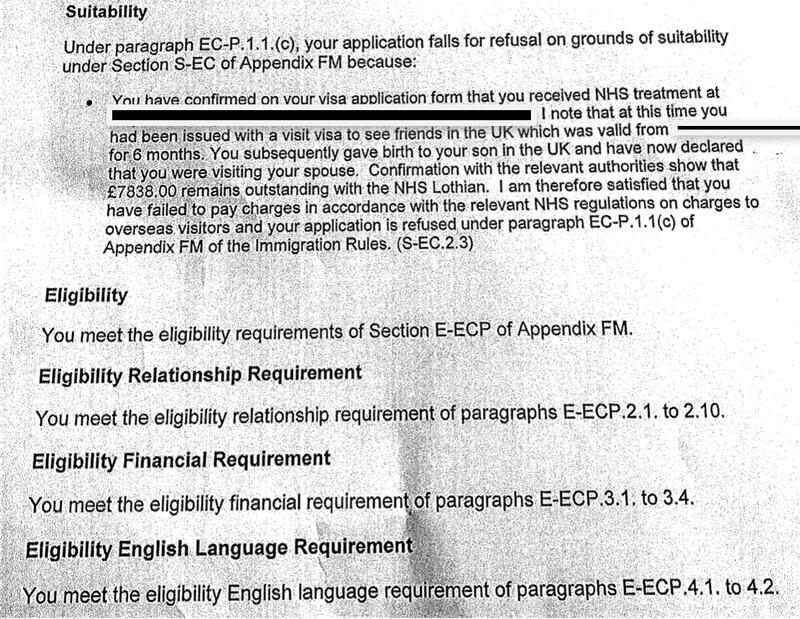 NHS debt was the sole reason for refusal in an otherwise successful Appendix FM spouse entry clearance visa application. My client is Turkish, her spouse British. Together they have two British children, the youngest of which was born in the UK at a time when the mother was in the UK as a visitor. I’ve reproduced a redacted version of the letter, though must apologise for the low quality: this was scanned to me using a mobile phone by a panicked client abroad. This refusal came as a surprise both to myself and to my client. I asked my client’s sponsor if he was aware of any outstanding debt to the NHS. He said no. This was curious, as the Home Office alleged a debt of £7,838, a specific and considerable sum. Clearly it would be hard to forget or miss such a debt. It was easy enough to identify the NHS treatment the Home Office were referring to in their letter. We had disclosed the dates and location of it ourselves in our online application form on the Visa4UK website. What took more vigorous investigation was where the alleged debt had come from. No invoice had ever been issued to my client or her sponsor. I asked my client’s sponsor to visit his local hospital in which his son was born to discuss this. After some digging they managed to locate an invoice for the figure the Home Office had quoted in the refusal letter. It became apparent that the invoice had been raised by the NHS at the express instructions of the Home Office’s “Counter Fraud Services” team. Prior to the Home Office’s instructions, the NHS had no intention of ever raising an invoice for this matter. The resulting bill was never sent to my client or her sponsor. “Remains outstanding”? “Failed to pay”? All of the language deployed by the decision-maker strongly implies that a) there has been an outstanding charge for some time and b) that the applicant, having been aware of this charge, has chosen not to pay it. Neither a) nor b) are true and indeed, cannot be, as the invoice was not issued until after the refusal was made! What appears to have in fact happened is this. A blameless migrant, married to a British citizen and with two British children, applies for a UK visa. She mentions in the paperwork that the second child was born here. The Home Office official considering the application slinks off to the hospital, gets them to run off an invoice for NHS treatment, and uses that unsent invoice as an excuse to refuse the visa. You have been very honest with us in your application and candidly told us about your pregnancy when you visited the UK last year even though we were previously unaware of it and would not have known about it had you not mentioned it. You told us that during that time you received emergency hospital treatment in Scotland, resulting in the birth of your British son. A lightbulb flickered. My spider-sense tingled. I decided to contact the hospital at which your child was born to ask them if you had paid them for the privilege. They said you weren’t issued with a bill for treatment, and as a consequence of course you had not paid them anything. I took this opportunity to contact our Fraud team and instructed them to strong-arm the hospital into raising a bill for your time there. The hospital calculated the bill at £7,838.00 and although at the time of writing they have not even formally raised this bill, told you about it or sent it to you, I am so eager to refuse your application that I am satisfied that this is an outstanding charge which you have clearly failed to pay. Your application is refused and I am satisfied that I have done my bit to make Britain great again. No communication of the charge, no opportunity to pay it, just a refusal of an application that had been outstanding for close to six months and for which the applicant had paid well over £1,000.That the Home Office can refuse an application in such a situation without even offering the applicant an opportunity to address the matter defies common sense and decency. S-EC.3.2. The applicant may be refused on grounds of suitability if one or more relevant NHS bodies has notified the Secretary of State that the applicant has failed to pay charges in accordance with the relevant NHS regulations on charges to overseas visitors and the outstanding charges have a total value of at least £500. This rule does not read: “If the Secretary of State has notified one or more relevant NHS bodies that she believes the applicant ought to have paid charges…” A subtle distinction, perhaps, but an important one. But wait, that’s not all. What surprised me somewhat was that had she been in England, the Home Office would have been correct to say that she ought to have been charged a fee. 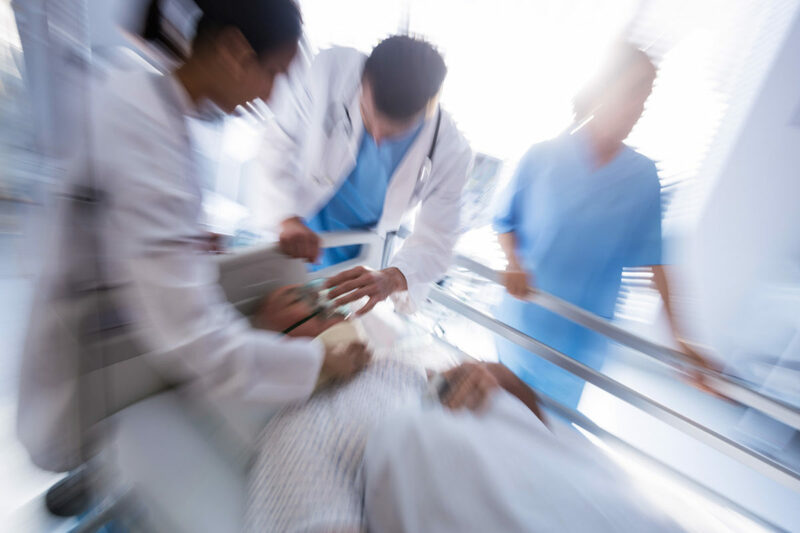 The National Health Service (Charges to Overseas Visitors) Regulations 2015 replaced the old National Health Service (Charges to Overseas Visitors) Regulations 1989. The 1989 Regulations were similar to those in force in Scotland in that they would have allowed a spouse or child access to treatment without charge. This is no longer the case under the new 2015 regulations (as amended). I suspect that the same goes for Northern Ireland, but will leave it to practitioners from that jurisdiction to correct me — do leave a comment if you know what the situation would be there. After reviewing the regulations, the local NHS board agreed that no charge should have been made to my client. That’s all very well, but try finding a direct email or telephone number to the Sheffield Entry Clearance Post to discuss this with somebody… My client had no choice but to incur the expense of drafting and lodging grounds of appeal to the First-tier Tribunal and in them requesting an Entry Clearance Manager’s review. To be fair to the Entry Clearance Manager, the decision was reviewed not long after receipt of the notice of appeal and the decision was withdrawn. But what if my client had not been in Scotland? Would she have had to pay the debt and then pay the fee to make a new application? Perhaps a practitioner from down south can weigh in on how they have dealt with these. It makes me uneasy that an invoice is raised behind my client’s back, only as a direct result of their honest disclosure of past medical treatment in the UK. One would hope for an equivalent level of honesty from our government and an opportunity for the client to pay anything due without having to re-apply at further expense and wait a further six months for a decision. John Vassiliou is a partner at McGill & Co, a Scottish law firm specialising in immigration and nationality.